Our company has been providing local homeowners with quality repair and replacement services for a very long time. We've encountered and dealt with practically every possible problem under the sun. Whatever's plaguing your door, count on us to fix it. Springs. Why does it always have to be springs? Well, because these components have the very crucial role of supporting the weight of your door panels, and therefore they are much more susceptible to wear and tear damage than any other part of your system. Handling them when they break (or even for a simple spring adjustment) can be extremely dangerous. Not to worry, though. Our experts can take care of it for you without jeopardizing anyone's safety. Openers. Why does it have to be – no, we're just kidding. Although, yes. Opener problems can be quite common, as this is the motorized unit that powers your door's operation. Being an electro-mechanical device, your opener can suffer from a very diverse range of different problems. From worn out motor gears to fried circuit boards and even broken pulleys, there's no type of issue our technician can't quickly and safely handle for you. While this type of problem is not as common as the ones mentioned above, it is known to have happened from time to time. Due to a variety of circumstances, you, your family members or even your neighbors can accidently back into your garage door with a car, which will most likely, depending on the force of the impact, break, or at least somewhat damage one or more of its panels. Our team can straighten out minor to moderate dents, and even replace the affected panels with matching ones if the damage proves to be too severe. 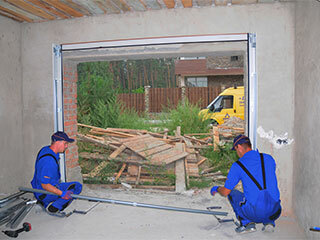 Repairing your garage door can be extremely dangerous, and you should always make sure to contact our experienced technicians to get the necessary work done safely and effectively. Call Garage Door Repair Gilbert today.